SANTA MONICA, Calif.--(BUSINESS WIRE)--Just when you thought you mastered all the levels in Crash Bandicoot™ N. Sane Trilogy, Activision Publishing, Inc., a wholly owned subsidiary of Activision Blizzard, Inc. (NASDAQ: ATVI), is giving fans another reason to play Crash™ all summer long with the introduction of a brand-new level called “FUTURE TENSE”! On June 29, the Future Tense level will be included as a bonus in the Crash Bandicoot™ 3: Warped game of the Crash Bandicoot N. Sane Trilogy. 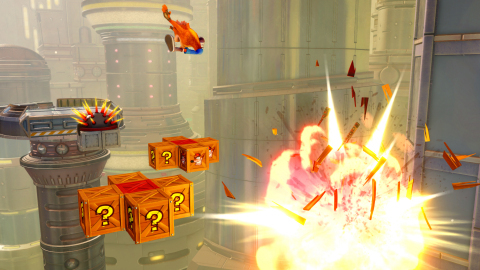 Additionally, in Future Tense, Crash and Coco will take on some familiar enemies and hazards in new and fun ways. Players will love playing the heart-racing, high-climbing level repeatedly to explore hidden areas and experience unexpected moments, including a challenging Death Route. 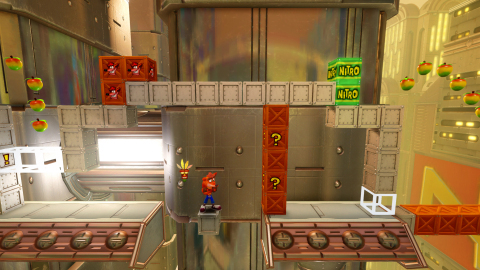 Future Tense will be accessible via a new platform in the Warp Room of Crash Bandicoot 3: Warped, and playable at any point in the game’s progression. In addition to Future Tense’s arrival to the Crash Bandicoot N. Sane Trilogy, fans on new platforms will also receive Stormy Ascent as a bonus level starting June 29th. Existing Crash Bandicoot N. Sane Trilogy owners on PlayStation®4 can download Stormy Ascent starting on June 15, 2018, as a bonus level at no additional charge from the PlayStation Store. Released last year on PlayStation®4, Stormy Ascent is the notoriously difficult, unfinished level from the original Crash Bandicoot game, finished and remastered to challenge the most hardened of Crash fans! Cautionary Note Regarding Forward-looking Statements: Information in this press release that involves Activision Publishing's expectations, plans, intentions or strategies regarding the future, including statements with respect to the expected release dates, pricing, features and functionality of the Crash Bandicoot N. Sane Trilogy, including the Future Tense and Stormy Ascent levels, are forward-looking statements that are not facts and involve a number of risks and uncertainties. Factors that could cause Activision Publishing's actual future results to differ materially from those expressed in the forward-looking statements set forth in this release include unanticipated product delays and other factors identified in the risk factors sections of Activision Blizzard's most recent annual report on Form 10-K and any subsequent quarterly reports on Form 10-Q. The forward-looking statements in this release are based upon information available to Activision Publishing and Activision Blizzard as of the date of this release, and neither Activision Publishing nor Activision Blizzard assumes any obligation to update any such forward-looking statements. Forward-looking statements believed to be true when made may ultimately prove to be incorrect. These statements are not guarantees of the future performance of Activision Publishing or Activision Blizzard and are subject to risks, uncertainties and other factors, some of which are beyond its control and may cause actual results to differ materially from current expectations. © 2018 Activision Publishing, Inc. ACTIVISION, CRASH, and CRASH BANDICOOT are trademarks of Activision Publishing, Inc. All other trademarks and trade names are the property of their respective owners. Crash Bandicoot N. Sane Trilogy Introduces New ‘Future Tense’ Level to Players on All Major Platforms this Summer!